Although Tim Bryant has had a number of books published, this, the first western to carry his name, is my introduction to his writing. The book is written in the first person and is filled with colourful characters. Most of the story follows Wilkie John’s trial but this is broken up by many flashbacks that tell the sorry tale of how Wilkie has ended in this deadly situation. Tim Bryant builds the tension extremely well and you’ll soon be wondering how Wilkie can possibly escape with his life as Gentleman Jack and a preacher argue the points for either taking or saving his life. Wilkie John’s backstory is one of adventure, love and violence. Wilkie has a wonderful way of getting round people who get in the way of him achieving his goals, yeap he ups and shoots them. So a white-hatted hero he isn’t. Tim Bryant tells his story with style and includes a lot of dark humour in both Wilkie’s observations and some of the situations Wilkie finds himself in. Bryant’s descriptions are top class too, painting vivid imagery of both characters and surroundings. The author also has a number of surprises waiting in store too, but to say more would ruin the story for those intending to read it and those readers ought to include all fans of the western genre. 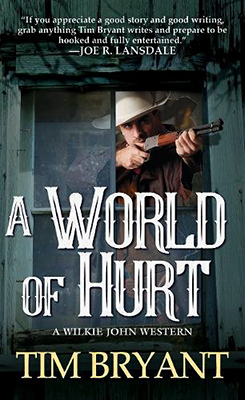 A World of Hurt is the first Wilkie John Western and the second, Dead and Buried is due out in June 2018 and I am certainly looking forward to reading it. Like most families, the Jensens gather together to celebrate the holidays. This year, since half the clan is scattered across the American West, they've decided to split the difference and meet up in Tucson. Matt and Luke will be there, for sure, and maybe Ace and Chance, too. That leaves Sally, Preacher, and Smoke Jensen, who've reserved three seats on a westbound stage to make sure they don't miss out on the festivities. What could possibly go wrong? Mother Nature is the first to strike, dusting up the trail with a sandstorm as blinding and deadly as any northern blizzard. Then comes an Apache ambush, forcing the passengers and drivers to seek shelter in a cave. Even if Smoke and Preacher manage to shoot their way out of this, they have another big surprise waiting--a ruthless gang of outlaws after the cargo of cash on the stage, happy to slaughter anyone who tries to stop them. If the Jensens hope to save Christmas this year, they'll need to save their own lives first . . . The seventh Johnstone book set at Christmas and the first one I’ve read. Great to see the author bringing together some of the Johnstone’s greatest characters but as expected the trail to their Christmas rendezvous doesn’t run smoothly. Most of the story concentrates on the dangers facing Smoke, Sally and Preacher as they journey together first by train and then stagecoach, and it’s whilst travelling on the latter that most of this tale revolves. 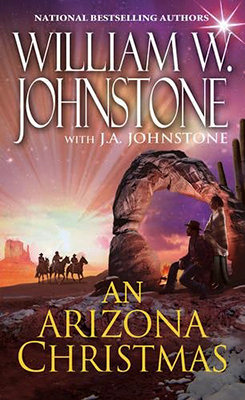 The stage is also filled with a number of interesting characters too and the author often switches between them as well as those attempting to stop one of them reaching Tucson. With outlaws, Apaches, and Mother Nature out to destroy the stagecoach and its passengers the book offers plenty of action and there is an impressive body count. Once the travellers are pinned down in a cave the tension mounts as you’ll be wondering just how they can possibly escape. 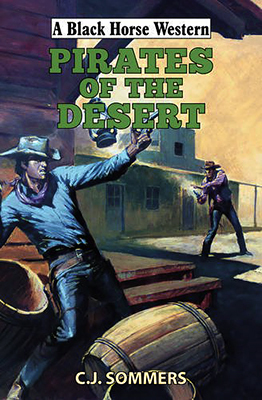 One thing I particularly enjoyed was the names of some of the characters, Ballard and Tuttle for instance which many long-time readers of westerns will recognize as past authors of the genre. A nod to those old time pulps which is strengthened by the comments in the last part of the story about newspaper reporters and writing for those pulps. If you’re looking for a fast read that is packed with gunplay then this is certainly worth adding to your ‘want to read’ list. The locals call the sand dunes of the Arizona Territory south-land a white ocean. One man, Barney Shivers, carries the comparison a little further when he decides to monopolize the shipping industry. Ordering his men to attack any freight shipping that he does not control, goods are stolen and held to ransom on the high seas. No one dares to fight back until one little old lady Lolly Amos, stands up to the bully. When the local law refuses to help, Lolly contacts her nephew, Captain Parthenon Downs of the Arizona Rangers. Restless to leave his desk duty behind, Captain Downs eagerly takes on the challenge. Little does he realize that his decision will draw him into a war between two bands of pirates, and a young woman with a Winchester rifle…. C.J. Sommers has created a wonderful cast of characters that will find themselves taking part in a lethal game, all due to the price of a bag of sugar. Good, bad, male or female, the author soon has you rooting for or against them. The plot moves forward at an extremely fast pace and there are a few twists to the tale waiting to surprise the reader with the revelations they bring, not least as to the real identity of some of these characters. It’s fascinating to see how Parth will bring down these land pirates, even though he knows, or believes he knows, who they are, getting the proof to arrest them is the hard part. Proving their guilt leads to plenty of gunplay as this tale weaves its way to its deadly conclusion. I’ve read quite a few books by the author behind the C.J. Sommers pseudonym, that person being Paul Lederer who also wrote other Black Horse Westerns as Owen G. Irons and Logan Winters, and I’ve yet to come across one that I haven’t thoroughly enjoyed. If you’ve yet to try anything by this author then this book would certainly be a great place to introduce yourself to his writing, and I’m sure after you’ve read it you’ll be hunting for his other books too.